I happen to love Instagram, and I follow Cheesy, which probably isn’t surprising to those who know me well. Cheesy posts just that – photos of cheesiness! And, one day I saw these – hollowed out croissants, baked with eggs, cheese, and bacon! At least I’m assuming that’s how they were prepared. I searched online and saw many similar recipes, but never found this photo. Aren’t these boats beautiful? During the holidays, I typically have croissants on hand and save them for various purposes. To use as is, obviously, or for baked French toast or bread pudding. The Williams-Sonoma croissants are really nice to have on hand; you can bake one or a dozen at a time. So here’s my version of croissants breakfast boats, and if anyone knows to whom to give credit for the photo of his/her boats, I’d appreciate it! Turn each croissant on its side and slice a “hat” off of the top. Discard the hats, then using your fingers, pick out the dough until you have a nice boat. Try not to make any holes! Place the prepped croissants on a jelly roll pan and preheat the oven to a roast setting. Place the onion and red bell pepper on another jelly roll pan, drizzle with oil, and generously add salt and pepper. Roast the veggies in the oven until caramelized, about 15 minutes. Remove the veggies from the oven and let them cool. Change the oven temperature to 350 degrees. 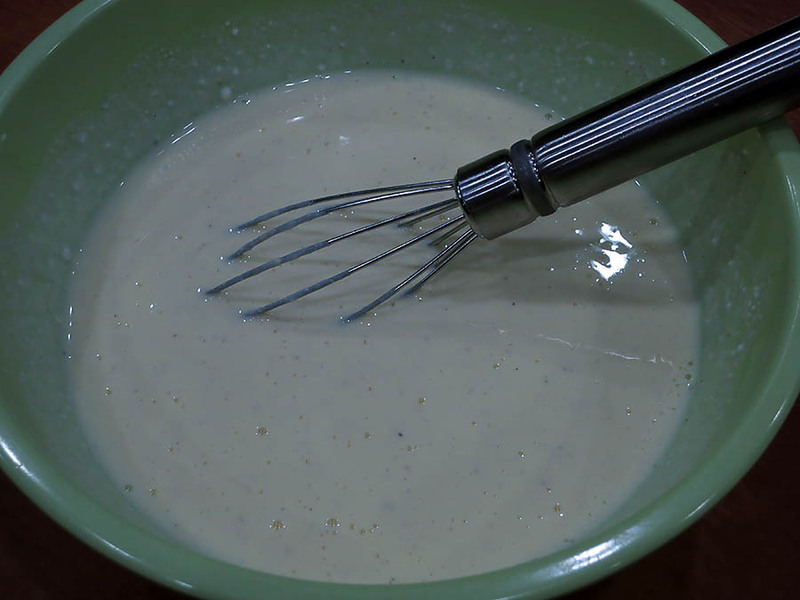 Meanwhile, whisk together the eggs and cream with the salt and white pepper. When you’re ready to bake the croissants boats, stir about 3/4 of the roasted veggies into the eggs and stir. Have all of the goodies prepped and ready. Gently, using a ladle, pour the mixture into the croissants. The only reason I spilled was that I was pouring with my left hand so I could take a photo with my right! Place in the oven and bake just until the eggs are firm, about 18 minutes; you don’t want rubbery eggs. To serve, sprinkle with bacon, feta cheese, and chopped green onion, plus the leftover veggie mixture. Optionally, include the sun-dried tomatoes, olives, black pepper and cayenne pepper flakes. Or, keep them plain and offer the goodies on the side. Instead of bacon you could use good ham or Prosciutto or sausage. The options are endless for these breakfast boats! The best part was finding out that I could pick up the breakfast boats and eat them like a sandwich! And there will be a next time! I’m not a huge fan of Emeril Lagasse. It’s not that I don’t respect his accomplishments, which are vast. In fact, he’s one of the longest lasting tv chefs in the U.S. We just never clicked. I didn’t get the “night show” element of live music on his cooking show, and the “BAM” was way overdone. Just my opinion. So I wasn’t completely thrilled when I received an Emeril cookbook as a gift. But when I opened the book, Prime Time Emeril, to a random page, it was to the recipe for Hot Corn Dip. Not being from the Midwest, I haven’t always been a huge corn fan like some people. I mean, it’s really good with butter and salt – on the cob, of course. But corn dip??? Well I made it, and it’s now one of my few repeat recipes I make in the summer. For this one recipe alone, I will always keep Prime Time Emeril, published in 2001. So here is my version of Emeril Lagasse’s recipe for corn dip, from his cookbook. 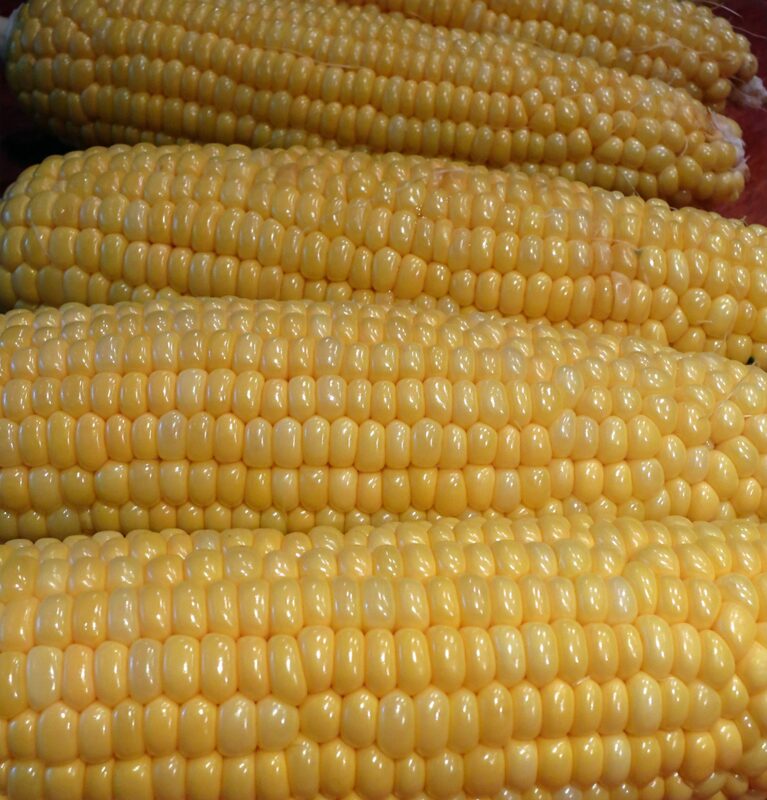 It’s especially fun to make when corn on the cob is 10 for $1.00! However keep in mind that to make it simpler, canned corn can also be used. Remove the corn from the corn cobs using a knife, slicing vertically on four “sides” of the cob. Then break up the pieces of corn into individual kernels. Cook the corn in boiling water for about 10 minutes; test it to make sure it is thoroughly cooked. Drain the corn in a colander, and set aside to cool. Place the butter in a large saucepan and heat it over medium-high heat. Chop the onion, red bell pepper and green onions. Add the vegetables and sauté for approximately 5 minutes. Then add the corn, the cream cheese and cubed or grated cheese, and allow the cheeses to completely melt into the vegetables. Add the salt and cayenne, or sprinkle the cayenne on top of the dip when serving. Serve the dip warm with good corn chips. I like the “scoopable” variety! I’ve also used mayonnaise in this dip along with cream cheese. It just adds a depth of flavor. Now to change things up. 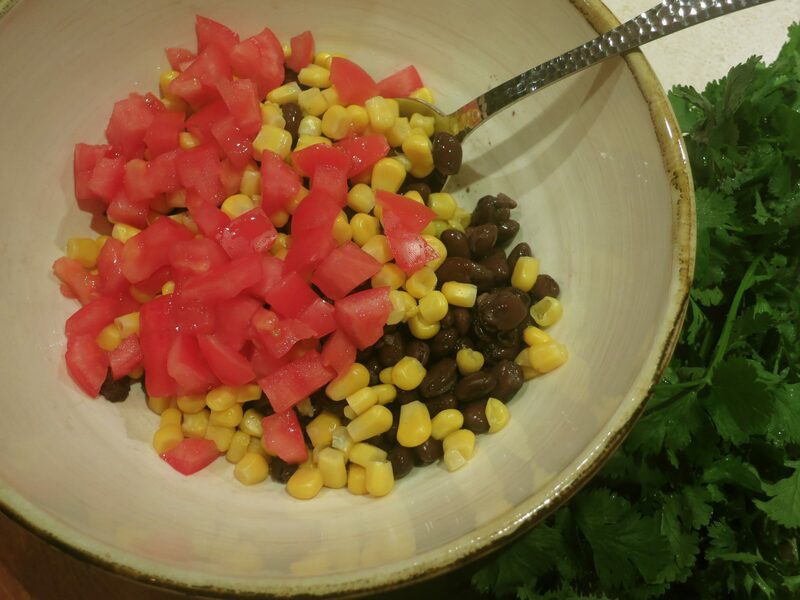 You can make a Southwestern version of this corn dip by adding chopped green chile peppers and cilantro, plus a little ground cumin. 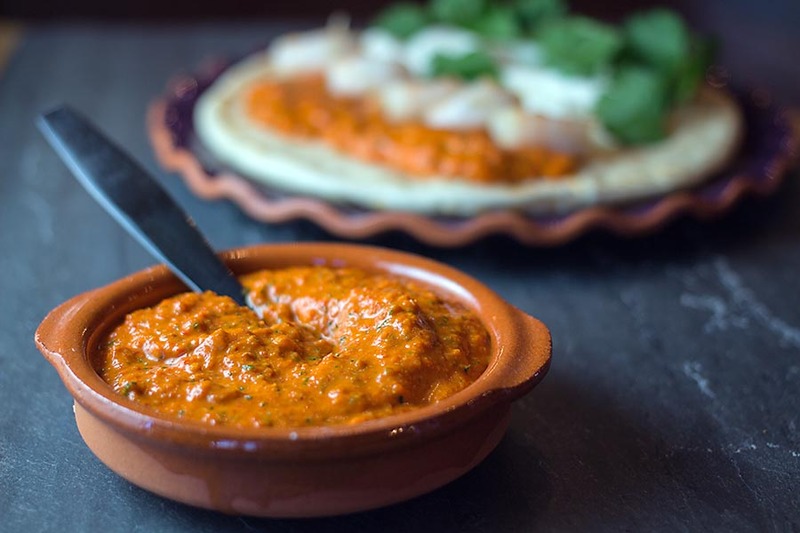 I’ve included made this dip with crumbled chorizo. Yum. Italian sausage also works. For a pescatarian option, add crab, some Old Bay, and top with chopped avocado! 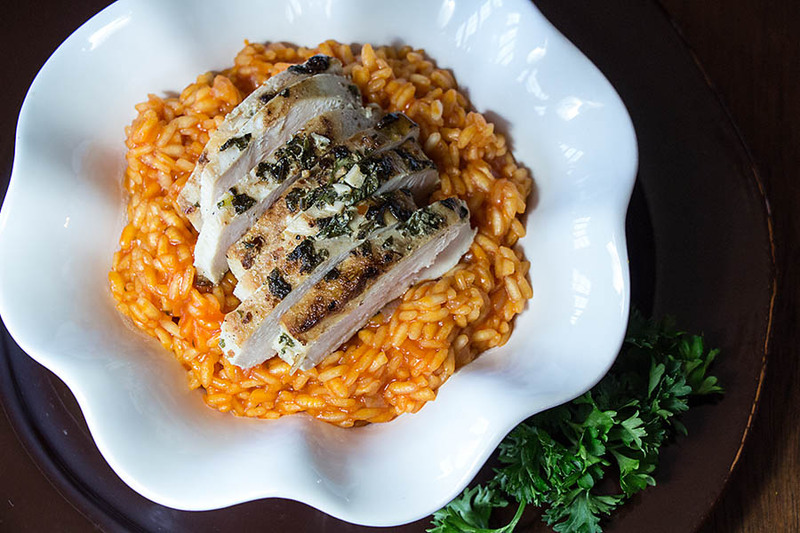 This dish is easy and healthy, and a nice change from all of the heavy meals typically served during the holidays. It’s simply seared sea scallops on top of layers of vegetables. What could be better!! So, here’s the recipe. Bake the squash using this recent recipe here. Then, after it’s cooled down, use a fork and scrape out all of the strands of spaghetti squash onto a serving platter; keep it warm. Rinse the scallops, and place them on paper towels to dry off; set aside. The next step is to clean the leeks. Leeks grow in soil, so they always contain dirt and silt that you need to avoid. Slice the white ends cross-wise. Place them in a medium bowl and fill the bowl with water. Separate the rings of leeks so that any silt sinks to the bottom of the bowl. Then remove the leeks from the water and place them on paper towels to dry. Using a large skillet or work, heat the oil over high heat, and add the red peppers and onion when it’s hot. Allow some caramelization, then reduce the heat slightly to cook the vegetables through. Add a little salt and pepper, then place them over the cooked spaghetti squash. Keep warm. Add a couple more tablespoons of oil and using the same technique, caramelize and then cook the leeks. 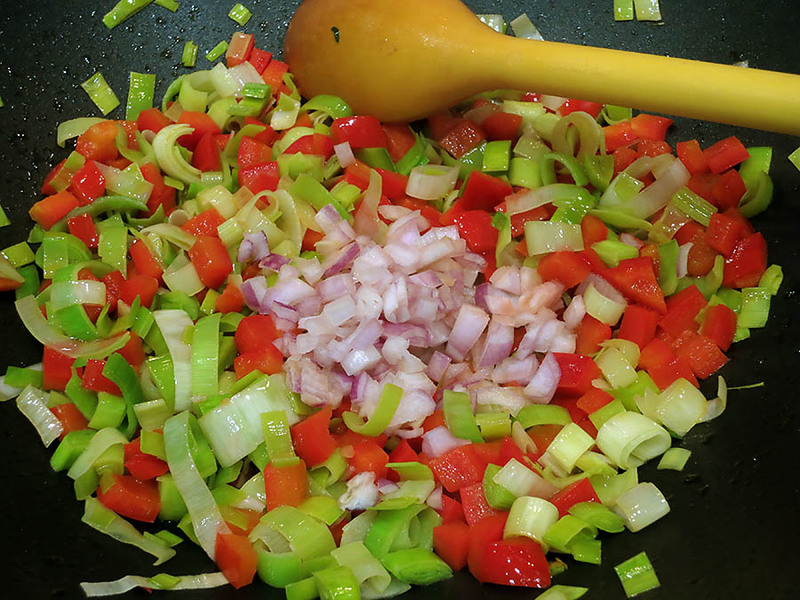 Add a little salt and pepper, then place the leeks over the red bell pepper and onions. Switch to a clean, flat skillet to cook the scallops, which should be completely dry. Add about 1 tablespoon of oil, and 1 tablespoon of butter and heat over high heat. The butter will brown, which only adds flavor. Sear half of the scallops in the oil and butter mixture, for at least one minute. Then turn them over using tongs and sear the other side. Make sure to also season them with salt and pepper, and even garlic pepper if you so desire. Turn down the heat a little if you feel they’re not completely cook through. Place them on a plate, and continue with the remaining scallops. When you’re ready to serve, make sure your vegetables are still warm, then top them with the scallops. Serve from the platter, making sure every serving includes squash, peppers, onions, leeks, and scallops. I love cayenne pepper flakes on this dish, and you can also offer Sriracha for extra spiciness! I have also smothered the cooked scallops in chile paste before, and you could always create a sauce with a Thai curry paste for an alternative flavor profile. But even straight forward, with salt and pepper, the scallop on the vegetables, all cooked to perfection, creates a fabulous dish! I served this dish with an Albariño, and it was a lovely combination. note: I could imagine this dish with also lovely sausages or grilled shrimp! Stir frying is something I do quite often in my kitchen. For one thing, Asian stir fries, with traditional ingredients, are simple and delicious. Secondly, they’re quite healthy, because of the lovely balance of meat or seafood and vegetables. They’re also a good use for leftover meat and vegetables, and mostly, I love them because no recipe is required. It does help to be familiar with Asian ingredients. My stir fries are more on the Chinese side, but add some fish sauce and you’ve got yourself a Thai stir fry! As I have said before, you can certainly follow recipes, but I often cook the inspired way. That is, being familiar with the traditional ingredients of a cuisine, and using those in your dish. It may not be a perfect stir fry according to Chinese chefs and grandmothers, but no Chinese food police are coming to my kitchen to arrest me any time soon! First, it’s important to have the basics – onion, garlic, and ginger. These can be part of the stir fry, or used in a marinade. If I do marinate meat before a stir fry, I only use a little peanut oil or olive oil – enough to blend the aromatics. Liquid additions are wonderful, but then the meat has to be patted dry before cooking. An oily marinade is just easier. The seasonings for stir fries are easy to find, fortunately. Soy sauce, mirin, rice vinegar, sherry, sesame seed oil, chile paste, hot sauce, and hoisin sauce. Other optional ingredients include fermented bean paste, shrimp paste, plum sauce (which I don’t care for) and oyster sauce. One Chinese seasoning is called Chinese 5-Spice, which, obviously, is a mixture of spices – cinnamon, ginger, cloves, star anise, and pepper. I’ve noticed that some also contain fennel. As with most spice and herb mixtures, I hesitate to use them. Just like using a purchased curry powder, every dish you make will end up tasting the same. For this dish today, I just want the meat, vegetables, and seasonings to shine. But use the spice mixture if you like it! The protein used in a stir fry has to be good quality and quick cooking. For example, I wouldn’t use beef or pork that requires 4-6 hours of cooking. I’m talking beef and pork tenderloin, chicken thighs and breast, scallops and shrimp. When it comes to vegetables, anything goes, unless you are expecting the Chinese food police to show up. Of course there’s traditional bok choy, Chinese cabbage, Chinese eggplants, snow peas, and so forth, plus ingredients that play a minor role like bean sprouts, dried mushrooms, chile peppers, water chestnuts, bamboo shoots, and cilantro. But if you want to use carrots and broccoli, you can make a delicious stir fry as well. Or spinach and tomatoes! The only requirement of a stir fry is that all the different components are cooked properly at the very end when all of they are all tossed together. So if you’re using carrots and broccoli, steam-cook them first until almost completely tender, then add them to the cooked meat at the end. Perfection! 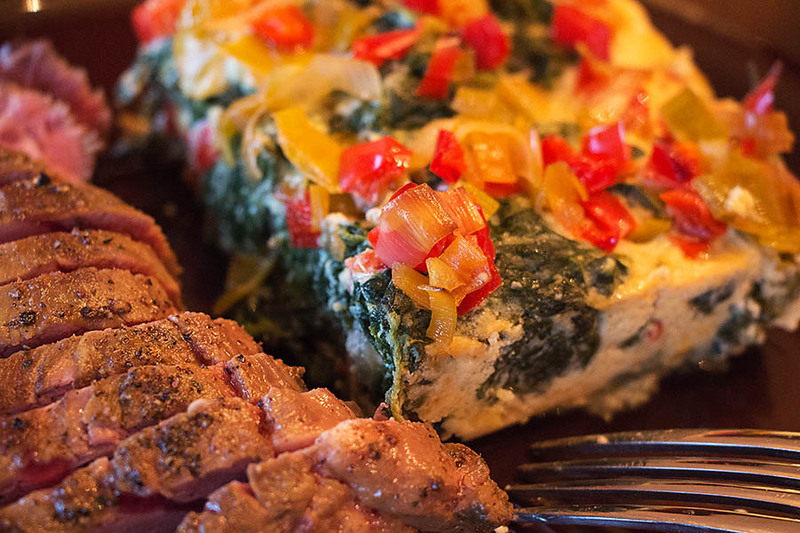 Spinach and tomatoes wouldn’t require any pre-cooking. It’s all about common sense. Here is the stir fry that I made using what was in my refrigerator one night. Enjoy, and make sure to customize it to your tastes and ingredients! Drain the beef well on paper towels, then place the cubed beef in a large bowl or re-sealable bag. I used the ends of a whole beef tenderloin, from which I had cut filet mignon slices, which is why the “cubes” are different shapes. The volumetric uniformity of the cubes is what’s important in a stir fry. Mine are on the large size, but uniformity is what’s critical. 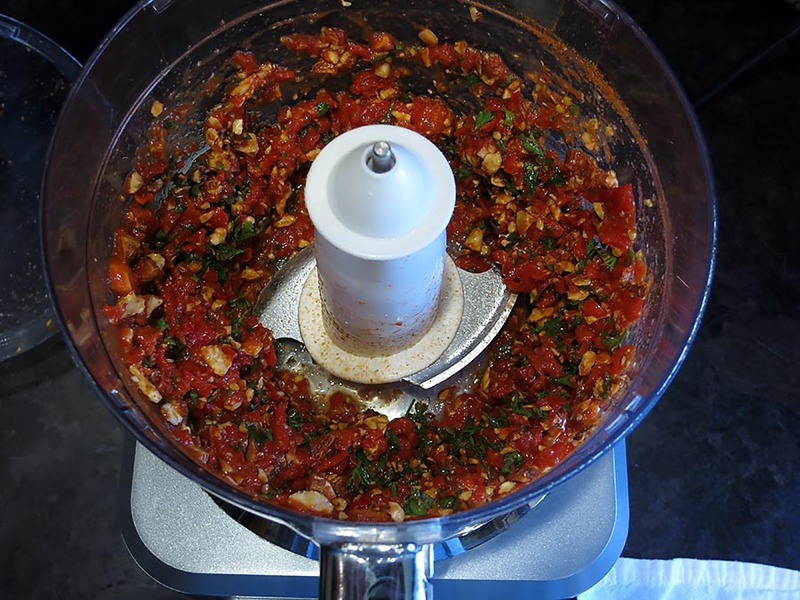 Add the oil, garlic, ginger, and salt to a jar of a small food processor. Process until smooth, then pour over the meat. Toss the meat, or bounce it around in the bag to make sure the beef is uniformly coated with the flavorful oil. Refrigerate for at least 4 hours or overnight. Bring the meat to almost rooom temperature at least an hour before beginning the stir fry. When you’re ready, begin by trimming the peas, if necessary, and steam them just until crisp-tender. For me, this was 5 minutes of steaming. Snow peas are thinner and would require less cooking time. However, cooking time also depends on how crisp you like your vegetables. Let the peas cool. If you think you have overcooked the peas, or any vegetable for that matter, toss a cup full of ice over the vegetables in a colander. This will cool them off faster, and the melted ice will drain away. Set the peas aside. In a measuring cup, measure out the soy sauce, mirin, hoisin sauce, and sesame see oil. Whisk the mixture, and set aside. If you’re not familiar with hoisin sauce, I’d suggest buying some. You don’t need much for fabulous flavor. It’s just a soy bean paste. There are different qualities and brands. This is the one I can find locally, but when I have the opportunity to visit an Asian market, I buy more “authentic” brands. Slice the onions and peppers to your liking. I like more of a wedge look. Have these in a bowl nearby. To begin, heat a large skillet or wok over high heat. Add about 1 tablespoon of oil* and just when it begins to smoke (have your ventilation system on) add a handful of cubed beef. Let them sit for a minute, before tossing around, then leave them alone for another minute or two. Get the cubes to the point where all sides show browning, but don’t allow any further cooking. Remember, there will be a little cooking boost at the end. Remove the beef with a slotted spoon, then continue with the remaining beef. When you are done with the browned beef, lower the heat on the stove by about half. Add the onions and peppers, and saute them, tossing them around occasionally to create some caramelization. If you want them cooked softer, you can put a lid on the skillet/wok for about a minute. when you’re happy with the “cook” of the onions and peppers, add the peas and toss gently. Then add the beef cubes and any juices that might have accumulated in the bowl. Immediately pour in the seasoning mixture, and combine it gently. Stir occasionally, to make sure the beef cooks through to your liking. Mine, of course, will end up medium-rare. If the stir fry seems like it has too much liquid, remove the beef and vegetables, using a spider sieve, and place in a large serving bowl. Then reduce the liquid in the skillet/wok. Pour the reduced liquid over the stir fry, toss gently, and serve. Most people enjoy rice with their stir fries, but I prefer it as is. Serve the stir fry with chile paste or sriracha or even cayenne pepper flakes for those who want a boost in heat. I’ve also included dried chile pepper slices, and you can always serve black or white sesame seeds for a pretty topping. * You may not need any extra oil if you have enough extra oily marinade. Make sure to use all of the marinade in the stir fry for extra flavor. note: Some recipes call for cornstarch to thicken the final sauce for a stir fry, but I don’t bother. If you’re not careful, the sauce will become gloppy, which reminds me of bad Chinese American restaurant food. It was my mother who first made a quesadilla in our home about the time I was in high school. Of course, she was the one who did the cooking, but there had never been Mexican food prepared in our home before. 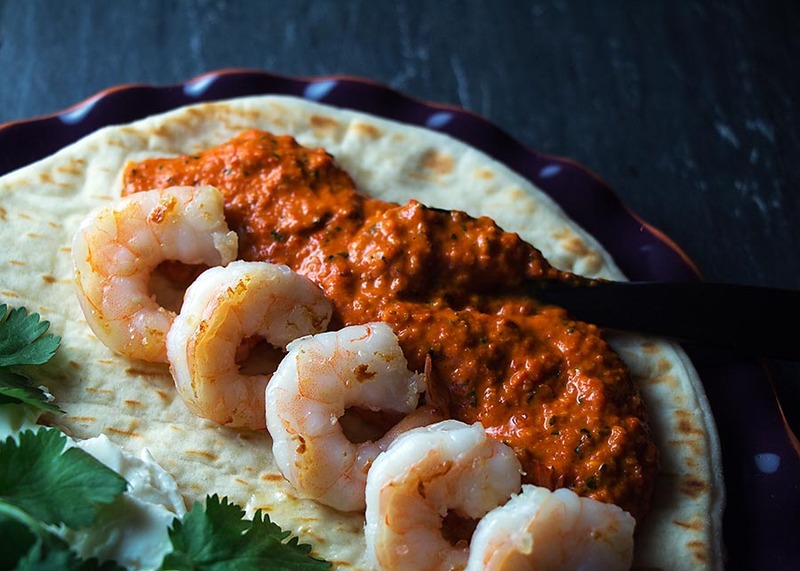 She cooked food from a lot of international cuisines, like Greece, Russia, France, India, Ethiopia, and China, but somehow had never been exposed to Mexican. Which is funny to me, because she really loves everything spicy. I think she eats more jalapenos than I do, and I love jalapenos! The way we all discovered Mexican food was at a restaurant in Park City, Utah. 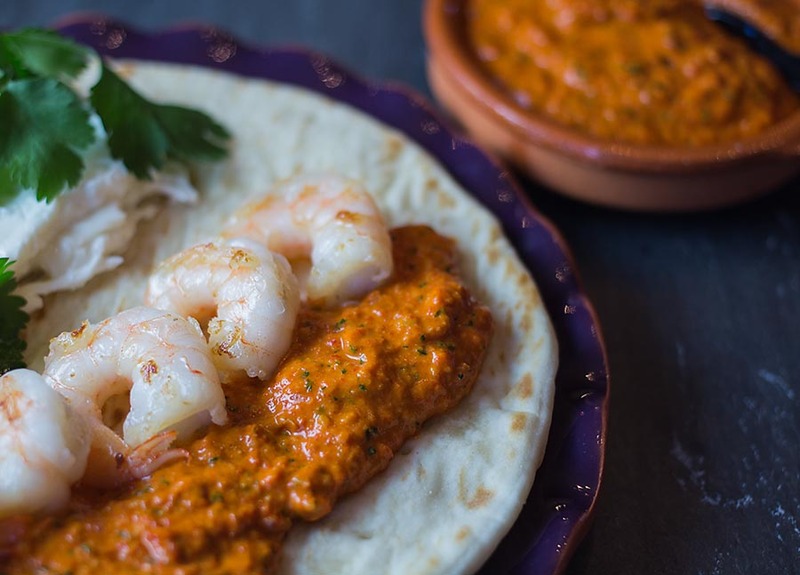 It was there where we fell in love with cheesy quesadillas, as well as other Mexican and Southwestern specialties. And being my mother, she went home and made them herself. So this is recipe I’m presenting for quesadillas is how I learned how to make them, from copying my mother’s technique. I honestly think they’re better than in any restaurant – browned, crispy, with cheesy wonderful goodness inside. Whatever ingredients you choose will work, I promise you, as long as there’s enough cheese to hold everything together! And that’s the fun part. Today I’m simply using chicken, purple onion, red bell pepper, poblano pepper, cilantro, and lots of Monterey jack cheese. Plus tortillas, of course. But you can add any meat, any kind of cheese, and any accessory ingredients. On two different occasions, back when I catered, I made quesadillas to order at parties. I had 2 skillets going, and used smaller tortillas, since one larger one can easily fill a person to the brim! The guests got to pick their ingredients. I even had chopped mango, which I love to mix with spicy beef and cilantro in quesadillas. Avocados work well, and are a good meat substitute, if necessary. It’s a really fun thing to do, even at your own party. For a smaller group, of course. In any case, today I present to you my way of making quesadillas. This will hopefully inspire you to try your own, using your favorite ingredients! Heat a little olive oil over medium heat in a skillet, then add all of the peppers and onion. Saute just until soft and set aside. Get out another skillet and place it over medium-high heat. Have all of the ingredients nearby; the quesadilla cooking process goes fairly quickly. First begin by adding about 1 tablespoon of butter to the hot skillet. It will brown, but that’s good. Place the tortilla in the skillet. Working quickly, place half of the cheese allotted per quesadilla on top of the tortilla, then place the chicken slices over the top. 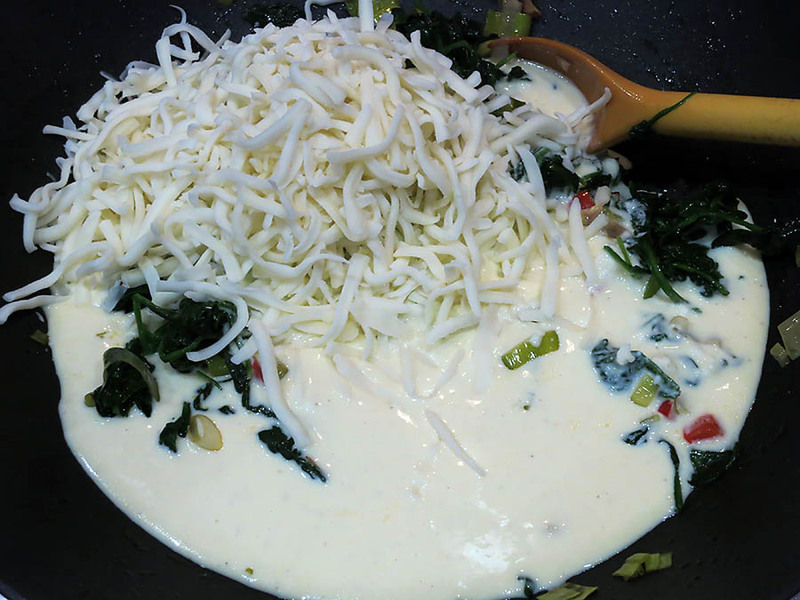 Quickly add the chopped cilantro and the remaining cheese. Top with another tortilla. Press down on it, then reduce the heat to practically nothing, and place a lid on the skillet. After a few minutes, flip over the quesadilla. That’s why it’s important to lower the heat, because you need the cheese to be melted to keep the two tortillas sticking together. Otherwise you won’t be able to successfully flip it. Raise the heat just a little bit to get some browning on the other side, but leave the lid on to heat everything through on the inside. Remove the quesadilla from the skillet and let it rest for about 5 minutes on a cutting board. It will cut better when you rest it. Continue with remaining tortillas if you’re making more. I am a huge fan of salsa, but for these quesadillas, I used green and red hot sauces that were given to me by Richard, from REM Cooks, when I met him in Dallas. He has recipes on his blog for both of these hot sauces, so if you have an abundance of chile peppers coming up in your garden, check them out. 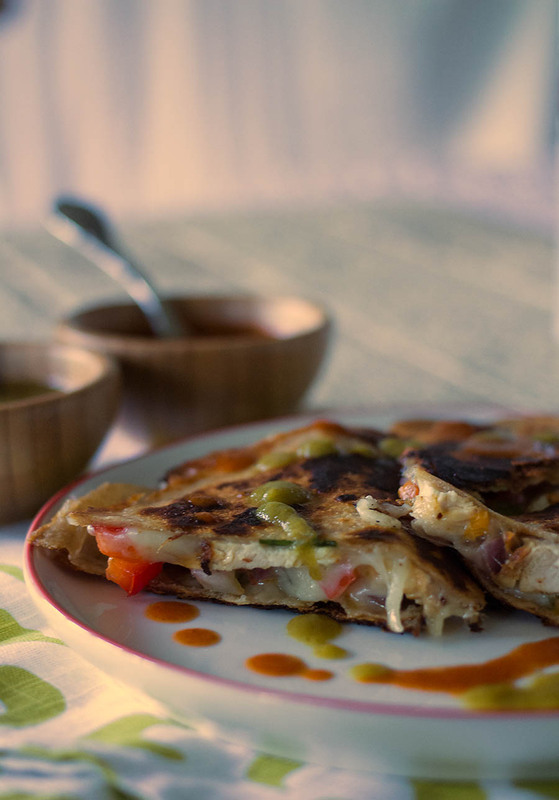 Quesadillas are best hot or warm, when they’re really crispy. The butter really does the trick in this recipe, but making adjustments with the flames help as well. If you have an electric stove – I’m sorry, I can’t help you. You probably have to be a little more careful! I wrote a post in late 2012 after I started my blog called “My New Favorite Ingredient.” I had about 4 followers then, and so I would like to re-introduce this ingredient on my blog. The ingredient, or product, was given to me by my friend who has Hungarian parents, and I will always be indebted to her for her act of kindness. The product? Paprika Cream. 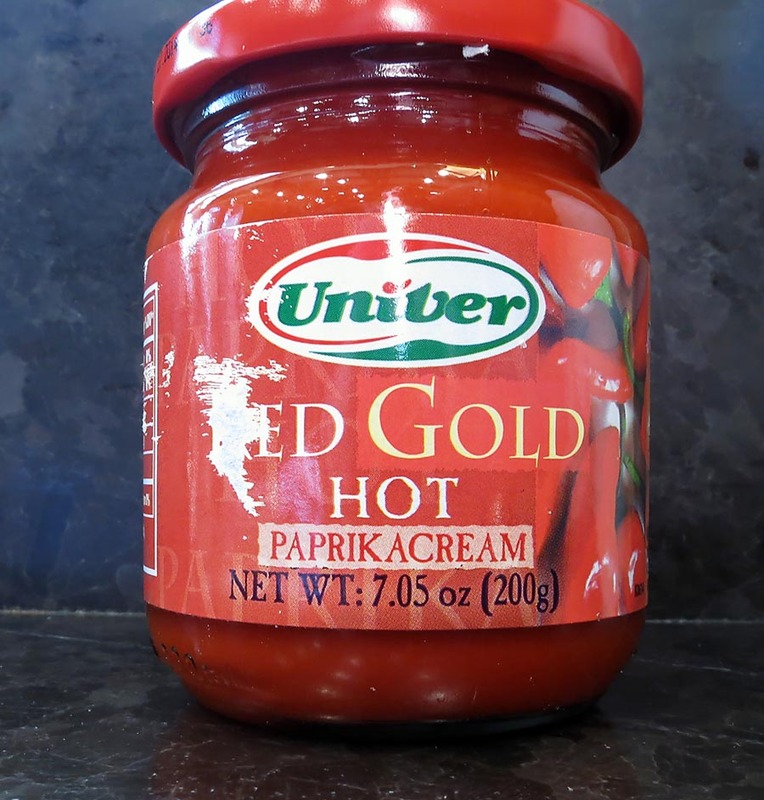 There are a few different versions of it, all made by Univer in Hungary, but they’re very much the same product – a paste or “cream” made from red bell peppers. There is one called Goulash Creme, Sweet Paprika Mix, and Hot Paprika Mix. The only way I can get my hands on more of this luscious stuff is to order online at Amazon.com, and they’re often out of the product. I would really love to taste a few of these varieties and see how they taste differently, but I can just be happy with one jar at a time, as they become available. 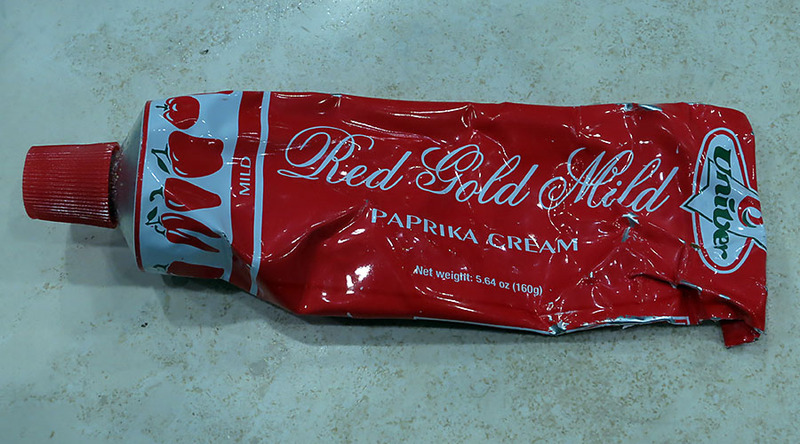 I have also gotten the Paprika Creme in a tube form. So today I wanted to make risotto, and I thought that the perfect way to season it would be to add some of this lovely paprika cream. It’s so much easier to add a few tablespoons of paprika cream instead of roasting your own red bell peppers and processing them into a pulp. Besides, these are the good red bell peppers – the ones from which paprika is made – so the flavor is not just about red bell peppers that are roasted, but also spicy hot paprika. And, the color is pretty spectacular, as well. You can use this cream for just about any culinary purpose for instant flavor, but I’ve also used it simply as a coating for pork tenderloin. It was fabulous. 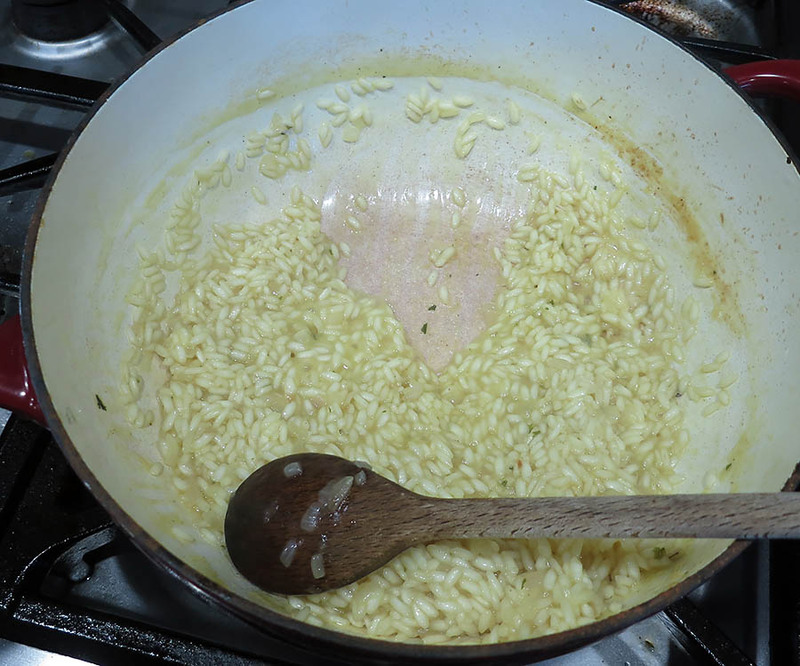 Anyway, if you’ve never made a risotto before – trust me – they’re very easy to make. I’ve even taught young girls how to make a risotto. Which is why it infuriates me on these cooking shows like Hell’s Kitchen when the trained chefs mess up risottos. It’s not hard, people!!! 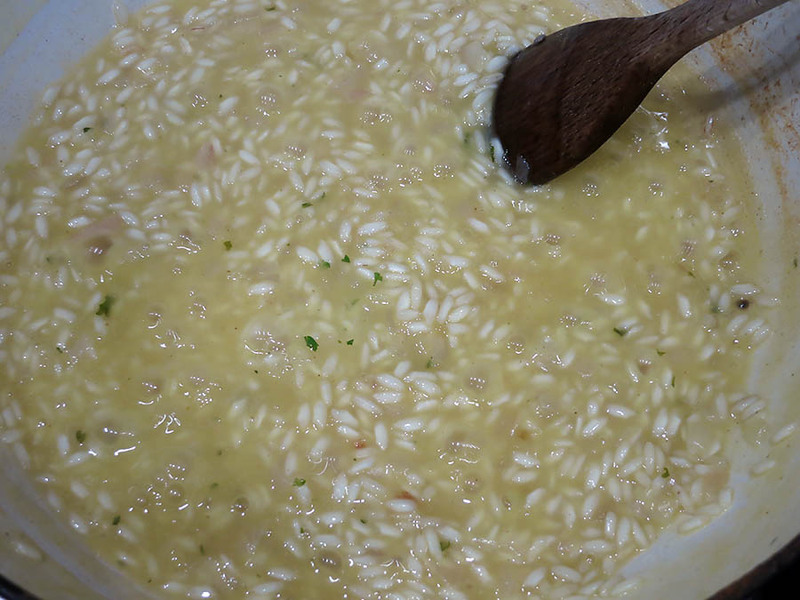 I’m not going to give you an exact risotto recipe, because to make a risotto is about so much more than following a recipe. You really have to feel the recipe, and let your brain be your guide. 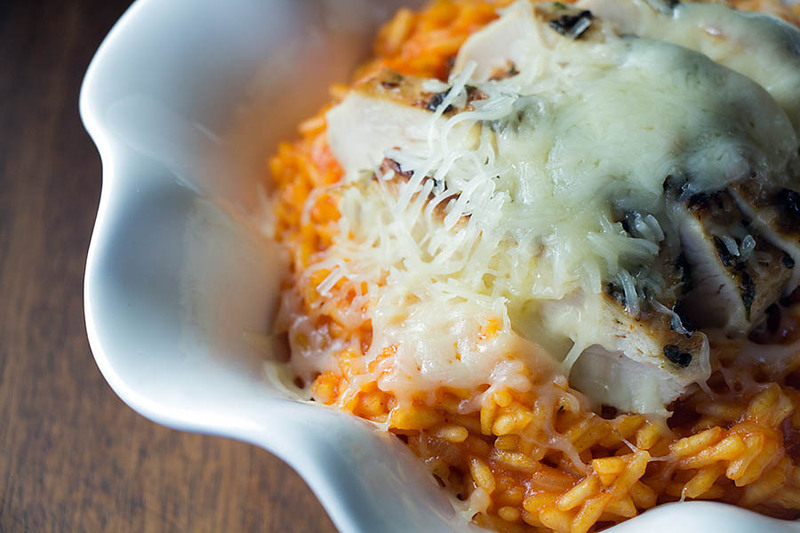 A risotto is a lot about common sense. 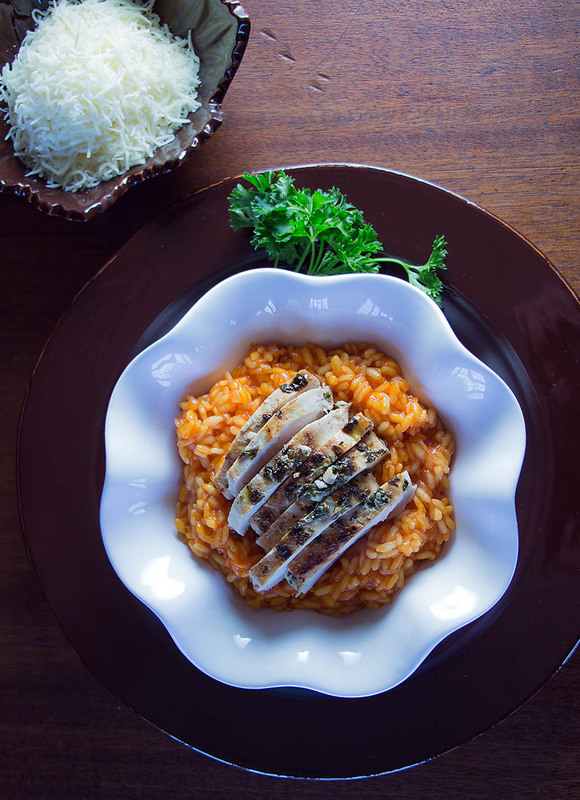 There’s a little elbow grease involved with risotto, as it requires a lot of stirring. But that’s not hard at all. The only rule is to not leave the kitchen while you’re making it. 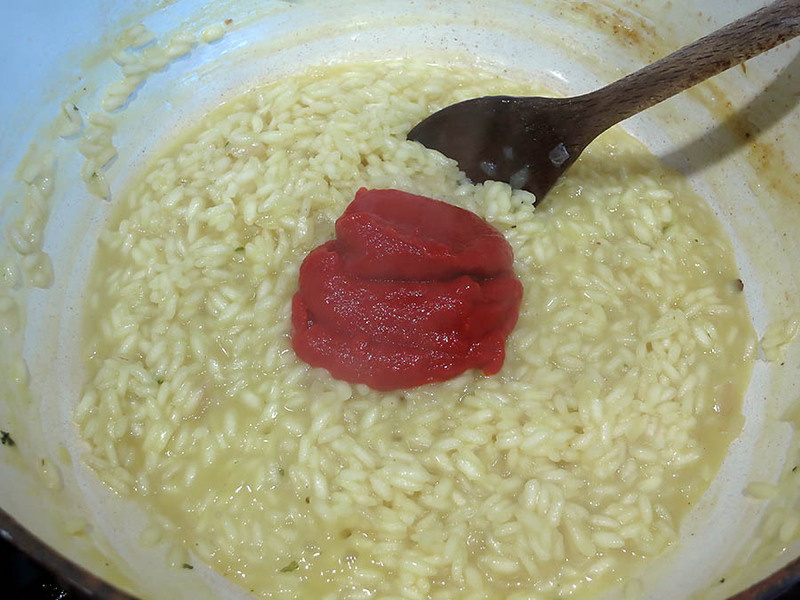 A risotto is a very hands-on dish. Place the butter in a medium saucepan over medium heat. There are pots made specifically for making risotto, but these aren’t necessary. A good saucepan and a wooden spoon will do. 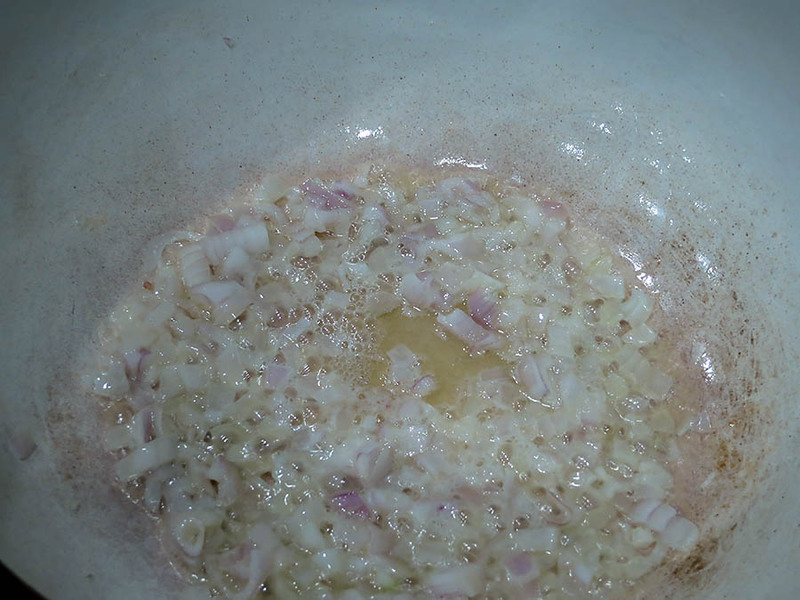 When the butter melts, add the shallots and sauté them for a couple of minutes. Then pour in the rice. Stir the rice all around, so that every bit of rice gets coated in butter. Stir the rice for about half a minute. Then pour in the wine. Immediately begin stirring the rice as it absorbs the wine. You will notice the wine disappearing before your eyes as you stir. You must keep stirring to prevent the rice from sticking. Once the wine is absorbed, begin adding the chicken broth, about 1/4 to 1/3 cup at a time. 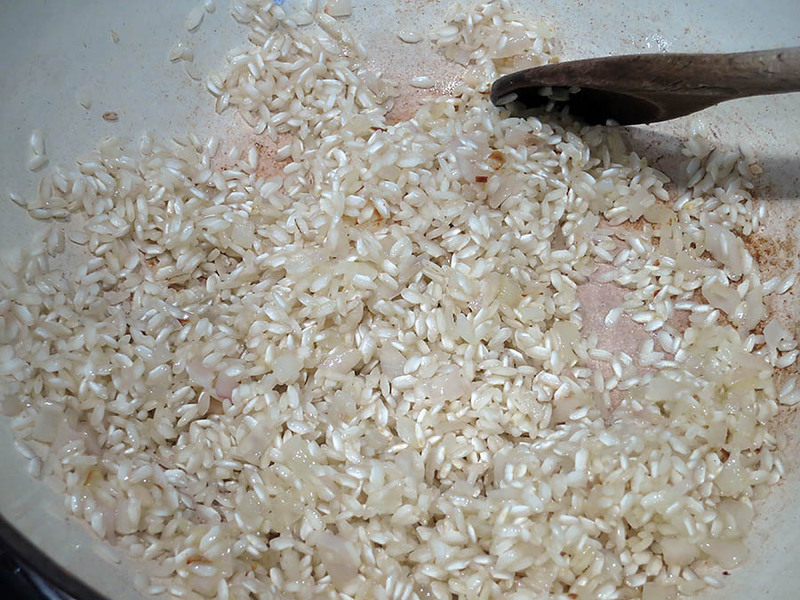 Stir the rice after each addition. 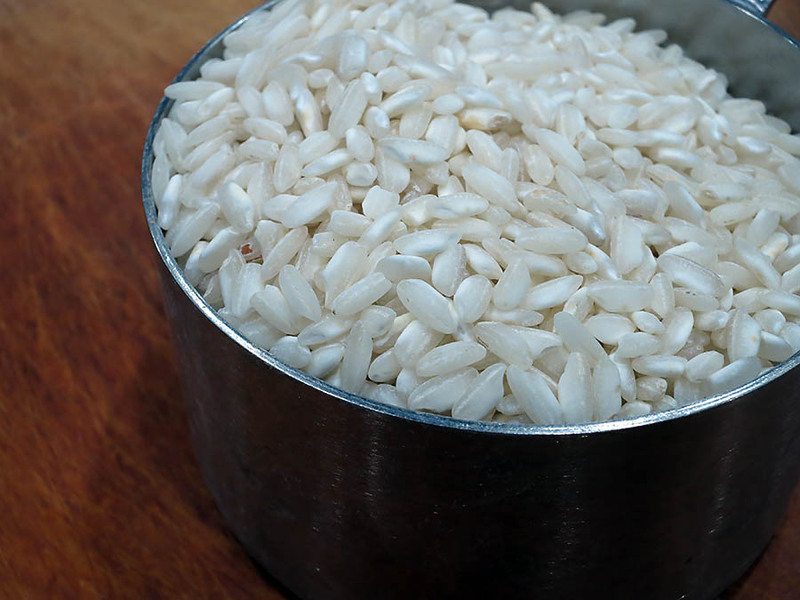 Every time the rice absorbs the liquid, you will have to make sure that you don’t wait too long before you add more liquid. Add liquid, stir. Repeat. Once you can tell that the rice has essentially stopped absorbing, add the paprika cream and the salt. If you’re not sure you’ll like the paprika flavor, add less and taste. But I’m sure you’ll love it. Once you’ve stirred in the paprika cream, you have a couple of options. 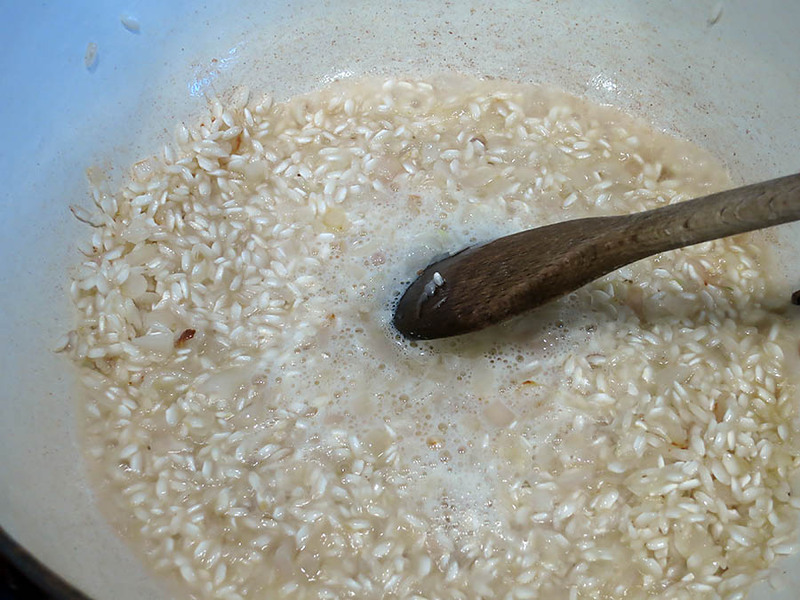 Sometimes, people add cream and/or Parmesan cheese to risottos. Both of these additions are fabulous. However, today I just want the rice to show off, simply flavored with broth, shallots, and paprika. Immediately put the hot risotto in a serving bowl. Today I added some left over grilled chicken, and I placed a bowl of Parmesan nearby. This was actually my lunch, and I got really hungry taking these photos. So I decided to go for it and I added a generous amount of Parmesan to the risotto! 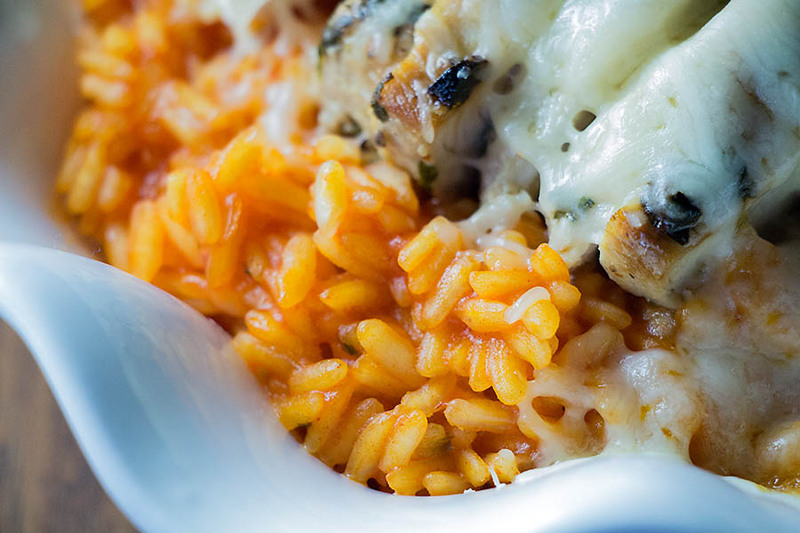 The creaminess and sharpness of the Parmesan was perfect with the chicken and the paprika-flavored rice. I will make this again. If you ever happen upon some version of this Univer product, make sure and grab some. You’ll find all kinds of uses for it, trust me! note: If you notice that the rice got really yellow while I was adding the chicken broth, it’s because my powdered variety of chicken broth is very yellow. My brain is old. At least, that’s my excuse. Or maybe my brain is just full of food-related trivia. Because occasionally I come across a culinary term or food name and I can’t, for the life of me, remember what the heck it is. But Romesco is one of those I remember. But it’s only because of a trick, not because it’s more significant in any way. You see, I can remember Ro-mesco, because it reminds me to think of Ro-asted red bell peppers. And that’s exactly what this sauce is. The base, at least, is roasted red bell peppers. It’s extremely easy to make. 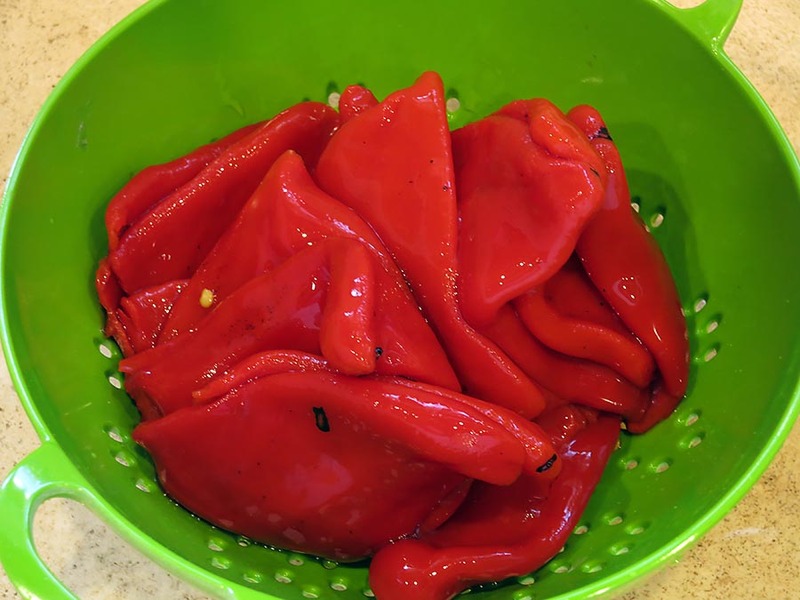 In fact, you can use jarred roasted red bell peppers instead of roasting your own. But the taste? It’s to me, the best flavor ever of anything that doesn’t contain cheese. And that’s saying a lot. 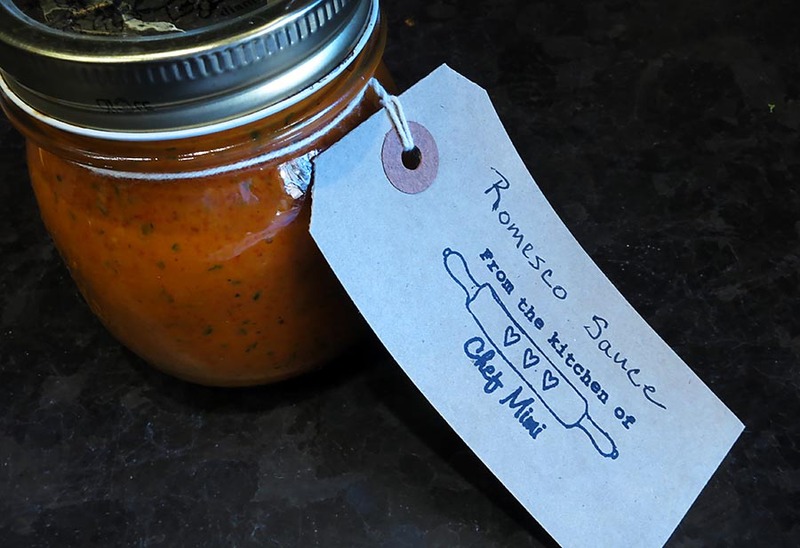 If you’ve never made Romesco sauce before, it’s high time you did. 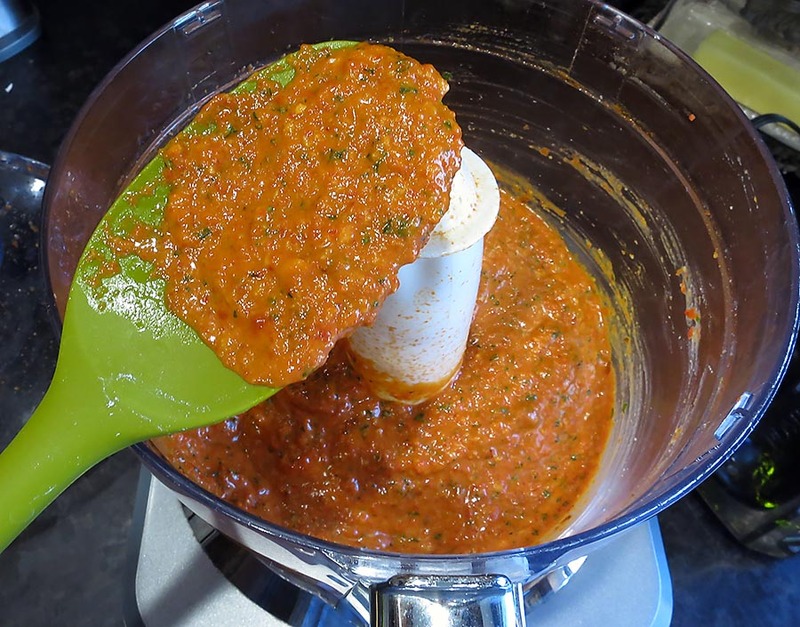 You will slather this beautiful red sauce on anything, including yourself, if you run out of breads and meats. It’s just heavenly. 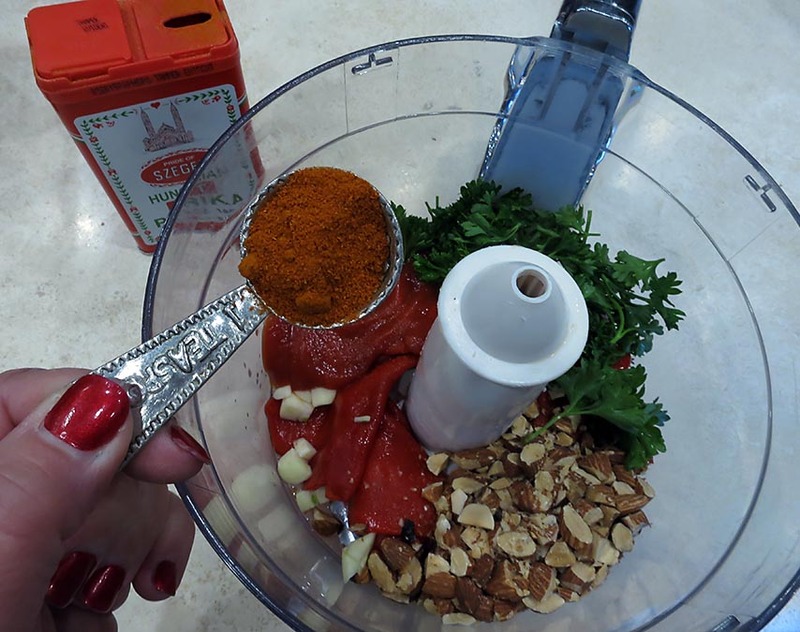 Besides the red bell pepper flavor, the sauce includes almonds, garlic, paprika, and cayenne. It’s Spanish in origin. And similar to a pesto, it all comes together with some olive oil. Only a food processor or blender is needed to make this. In 5 minutes tops you will get the opportunity to smell and taste heaven. Promise. Drain the red bell peppers before you begin. Have all of the other ingredients ready to go. 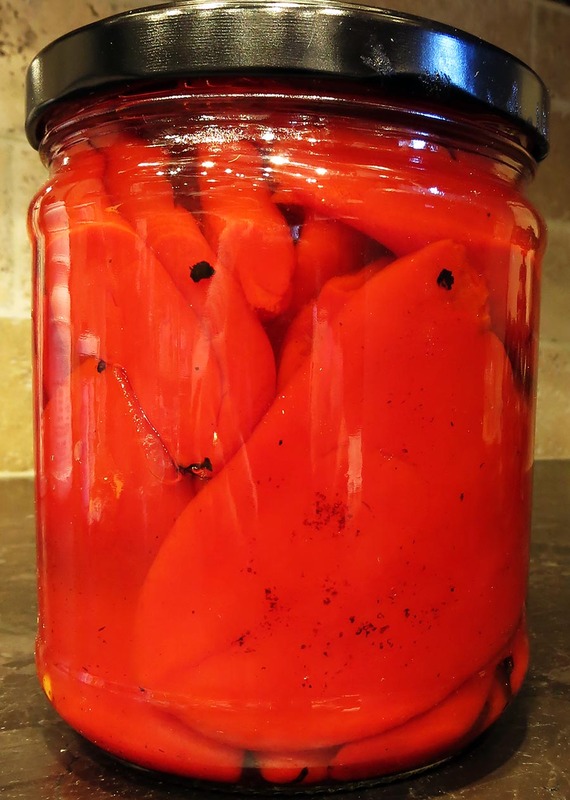 Place the drained red bell peppers in a jar of a food processor. 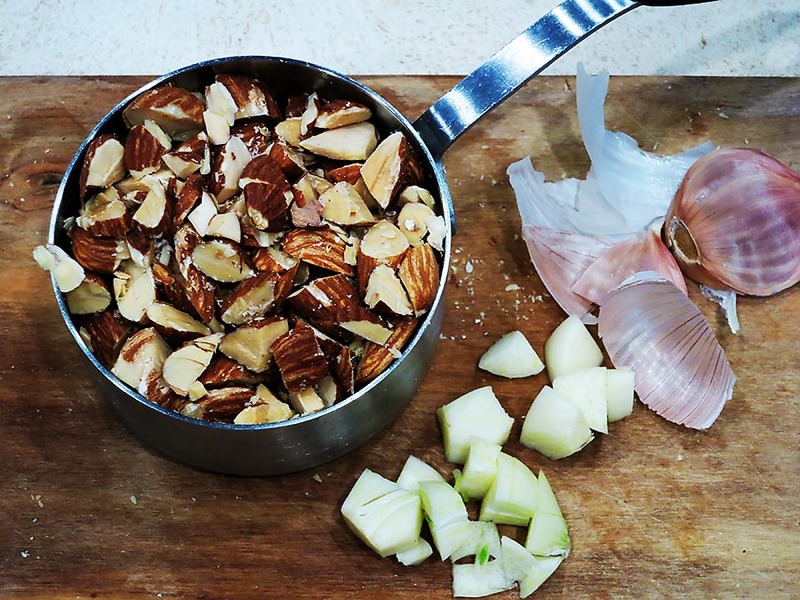 Add the almonds, garlic, tomato puree, parsley, and red wine vinegar. Then add the hot paprika, cayenne pepper, and salt. Begin processing. The mixture will be very coarse at first. Continue processing, adding the olive oil a little at a time. It is also important to wipe down the sides of the jar with a spatula. After all of the oil has been added, process until the sauce is smooth. There will be some texture to it, but it will still be a smooth sauce. At this point, it is ready to use. 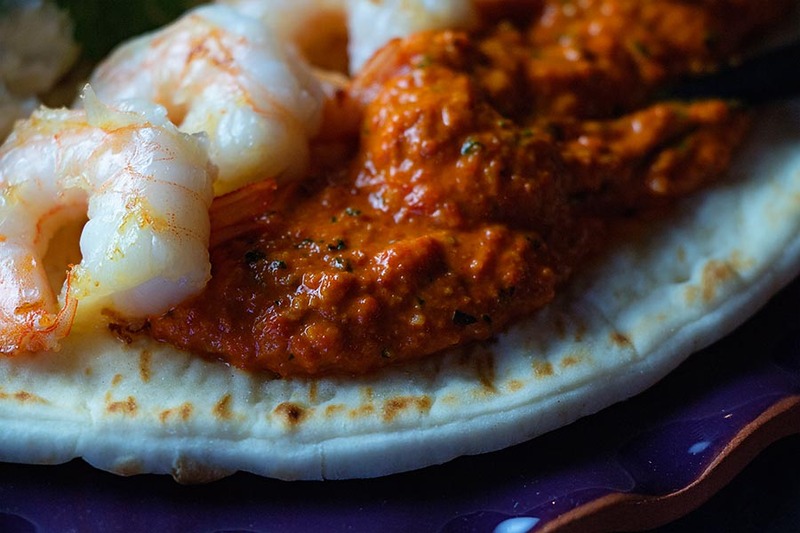 I chose to make a Mediterranean-inspired lunch using the Romesco spread on a flatbread, and with grilled shrimp placed on top. I also added some buratta and fresh cilantro; I was out of goat cheese – shame on me. I bet you’re already thinking about all the ways you can use this sauce. It’s exquisite, isn’t it?!! 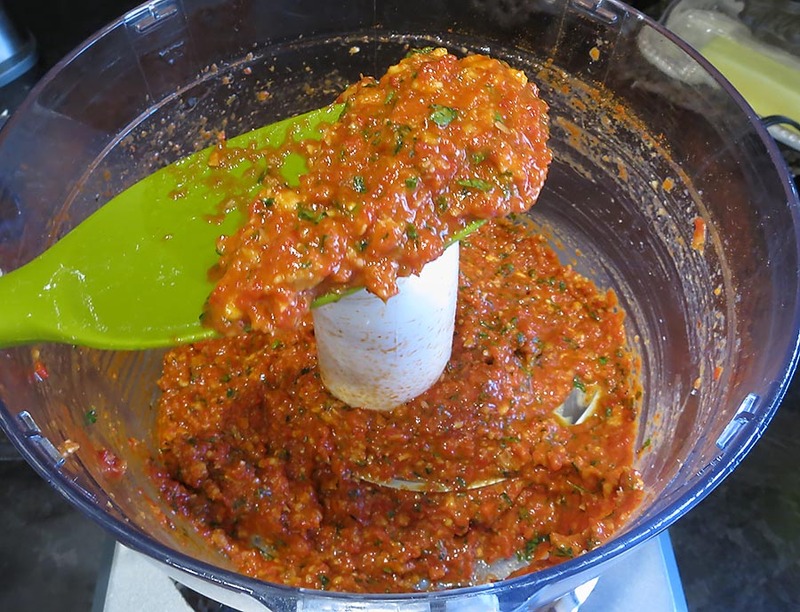 Fortunately, Romesco sauces freezes well. Otherwise, plan to use it before a couple of weeks if you store it in the refrigerator. And thank you daughters for my cute labels! I happen to love spinach. I much prefer it to kale, which I know is so trendy right now. Well, no one’s ever accused this old lady of being on trend. 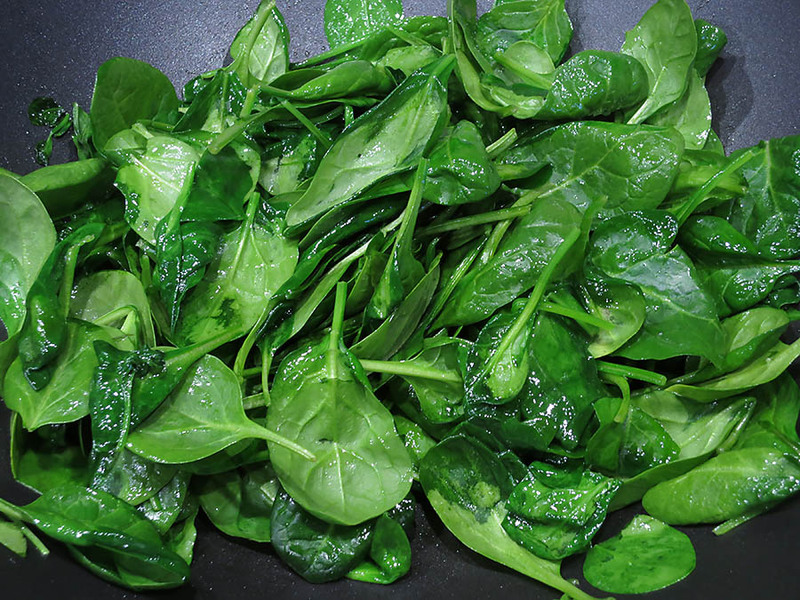 Spinach is fabulous raw, like in salads or even sandwiches. But when it’s simply sautéd with some oil and garlic, or creamed, or baked in a gratin with some ricotta or cheese, it becomes even more magical. 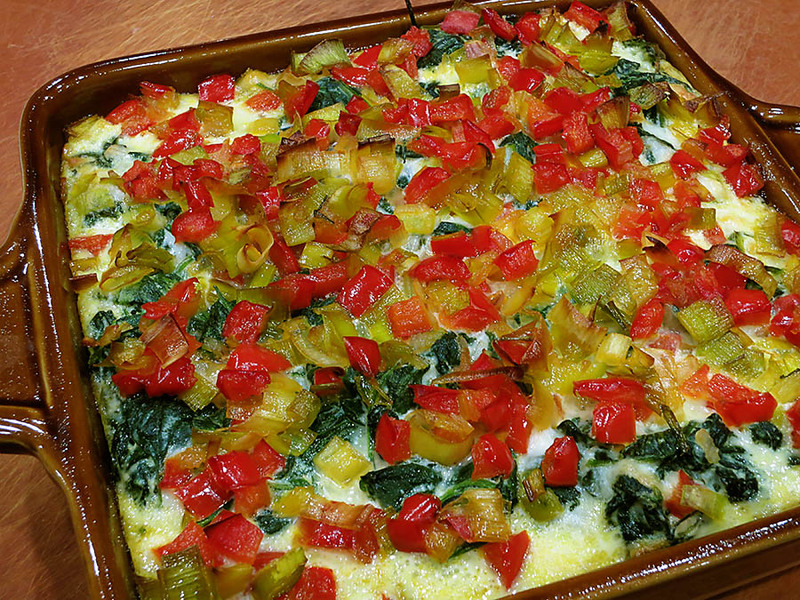 This is one of those magical gratins featuring spinach, plus leeks and red bell peppers. Yes, Christmas colors in a gratin. I can’t help myself. Green and red are two of my favorite colors. Another reason that I love Christmas so much. 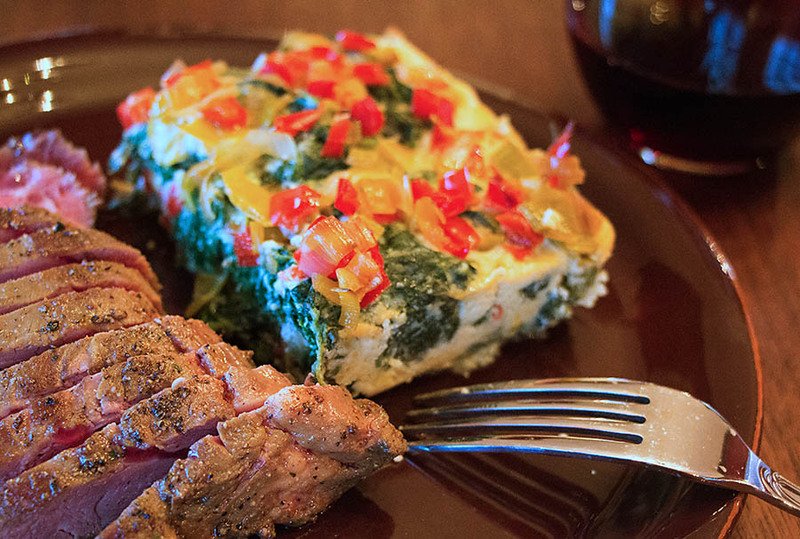 This gratin is easy to make, and can be made ahead and reheated as well. It’s a fabulous side dish to protein. This evening I paired it with grilled flank steak. You don’t even need pasta or potatoes added to the meal, because there’s plenty of heft from within this gratin. Using a large skillet or even a wok, heat a little oil, about 1 tablespoon over medium high heat. You will need to work with the fresh spinach in batches, so it’s manageable. Add approximately 1/4 of the amount of spinach to the skillet. 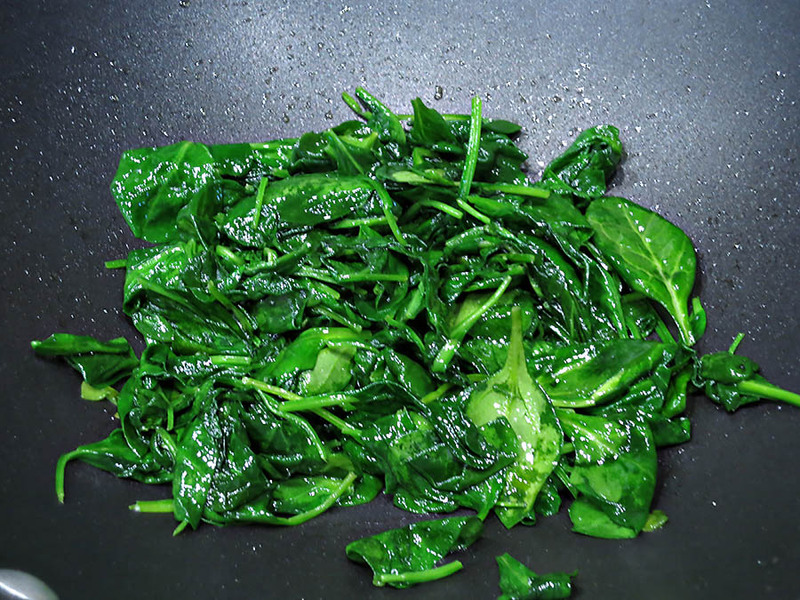 Carefully toss and turn it around so that every spinach leaf touches the hot skillet and gets coated with the oil. It takes a few minutes for the spinach to completely wilt. 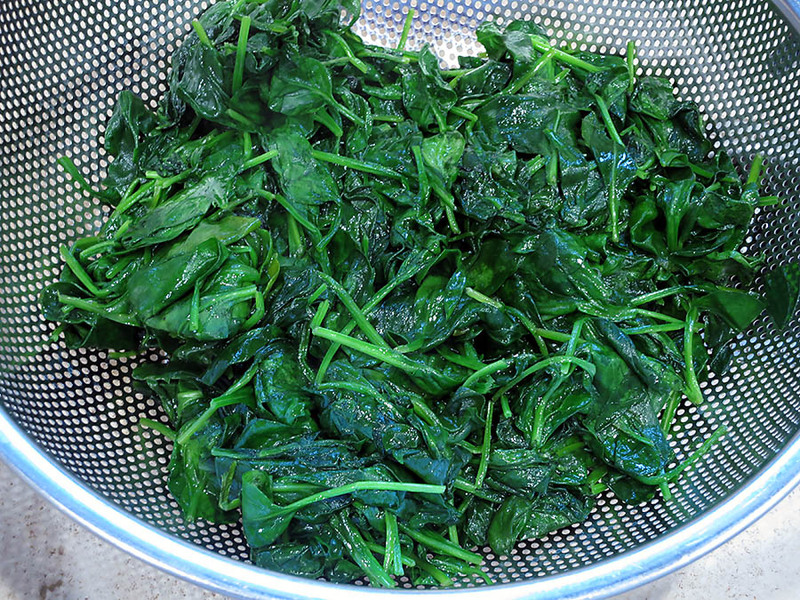 Place the sautéd in a colander in the sink, and return to complete the remaining spinach. Meanwhile, place the ricotta, cream, eggs, salt and white pepper in a medium bowl. Whisk the mixture until smooth. . Using the same skillet, heat a little oil, about 2 tablespoons, over medium-high heat. 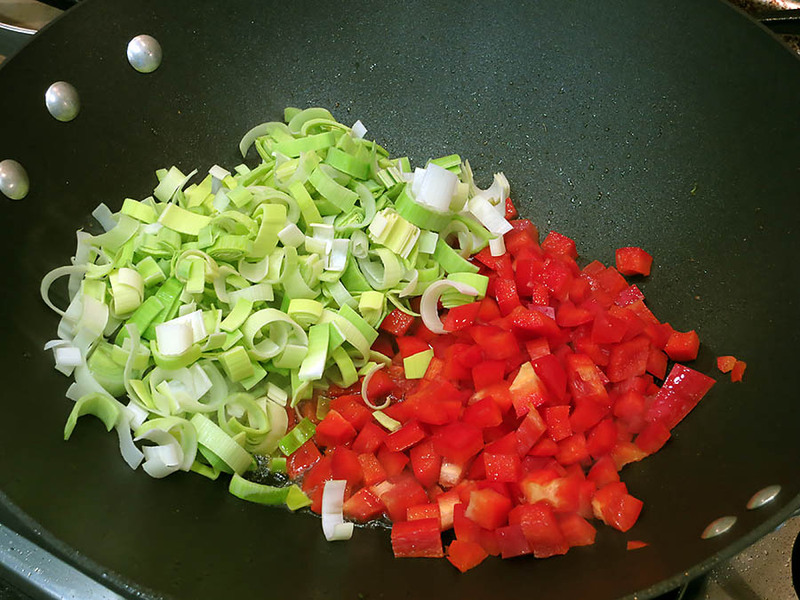 Add the red bell peppers and leeks to the skillet. Sauté them for a few minutes, then add the shallots and sauté for another few minutes. Then turn off the heat and let the vegetables cool off a bit. Then remove approximately half of the vegetables and place in a small bowl; set aside. Using your hands, if the spinach is cool enough to handle, grab a handful of spinach and squeeze the excess water out of it. 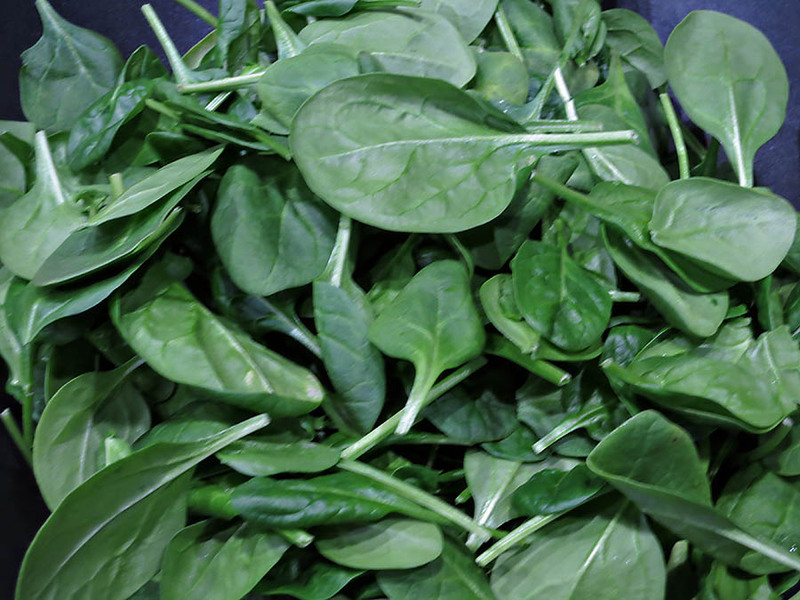 Alternatively, you can roll handfuls of spinach in paper towels or clean dish towels to remove the water. 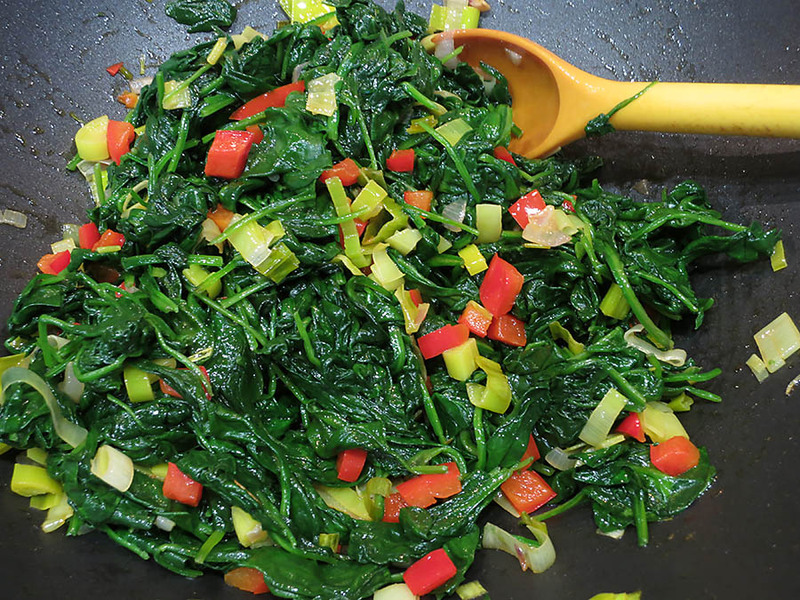 Place the dried spinach into the skillet along with the vegetables. At this point, pre-heat the oven to 350 degrees. Stir the spinach and vegetable together to combine. Then add the ricotta mixture to the skillet. And add the grated cheese. 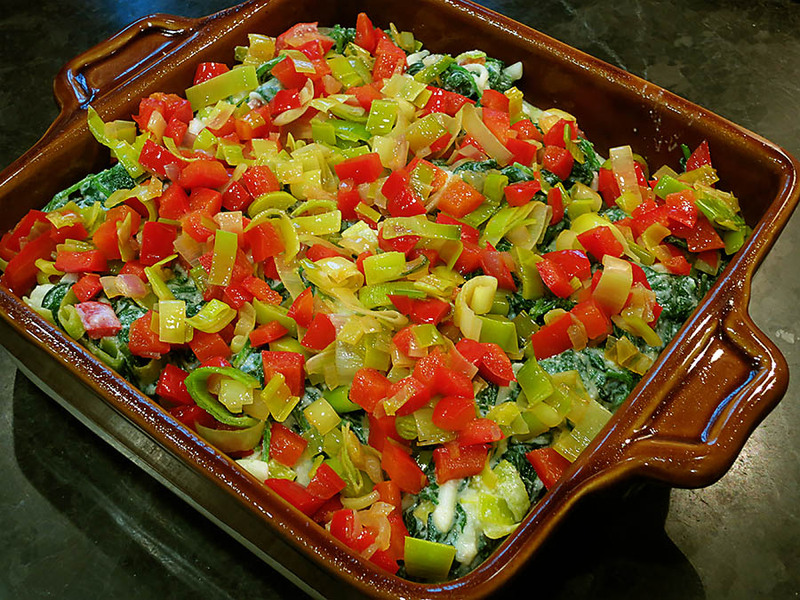 Stir the vegetables and the ricotta mixture well, then turn it out into an 8″ square baking dish, greased if necessary. Sprinkle the top with the saved red bell pepper and leeks. Bake for approximately 55 minutes; you can test the gratin with a cake tester, and it should come out clean just as with a quiche. 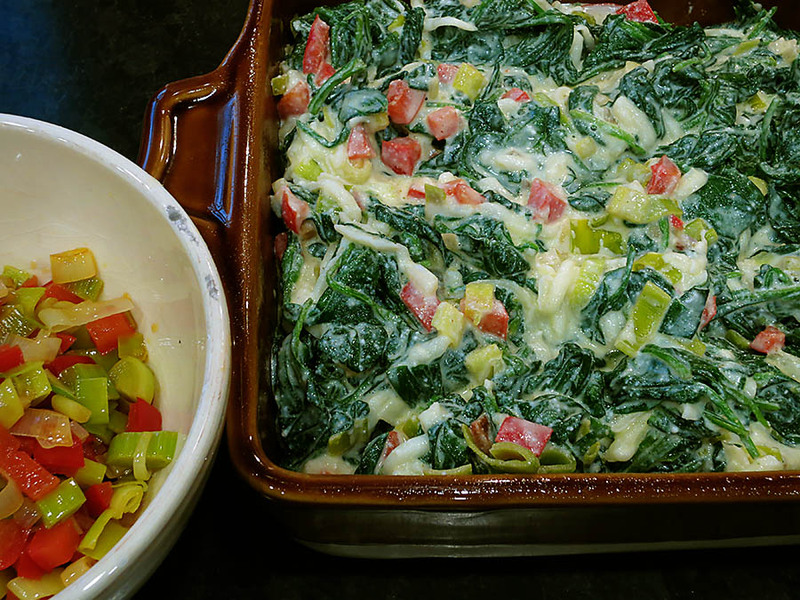 This gratin is very spinachy, but it’s also blessed with a soft, quiche-like interior, plus a sprinkling of vegetables. It’s slightly rich, but also very hearty. I hope you enjoy it! * You could use jarred roasted red bell peppers if you wish, instead of raw, but I don’t think the resulting flavors will be much different. I use black beans all the year round. They’re delicious and versatile, and they’re also healthy. I make black beans from scratch, refried black beans, black bean soup, black bean gratins, black bean dips, black bean enchiladas and black bean flans. Fortunately, everyone in my family loves black beans. 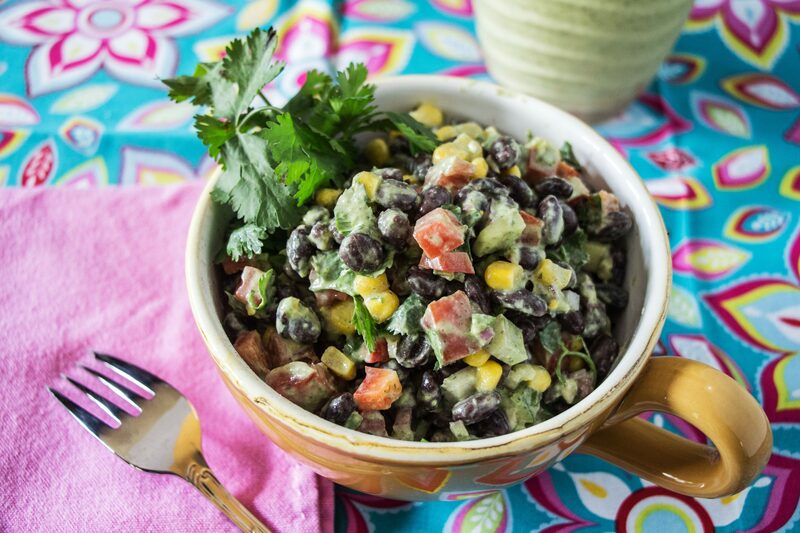 In the summer I tend to throw black beans along with other goodies together to make salads – especially when I have company. And it’s so surprising how well these salads go over. You can make them ahead of time and they’re so easy!!! 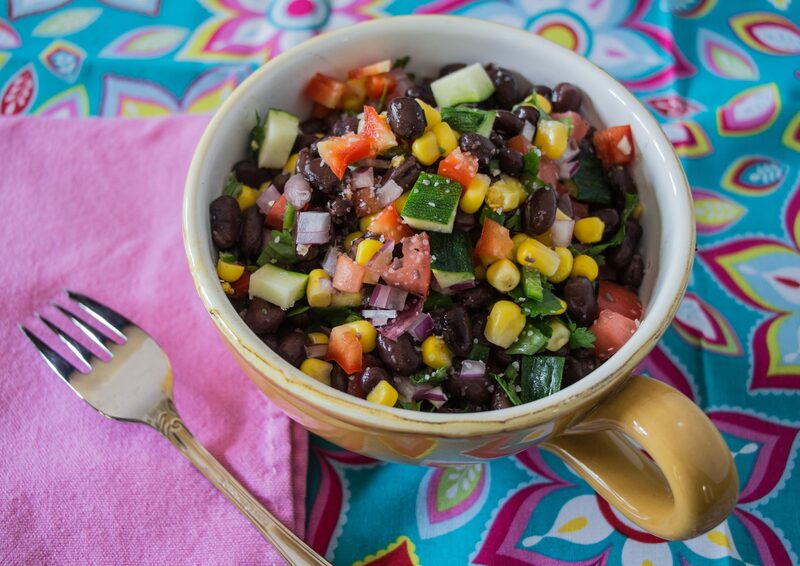 These black bean salads are vegetarian, but you can always serve grilled chicken or shrimp to top the salad, for those who desire more protein. 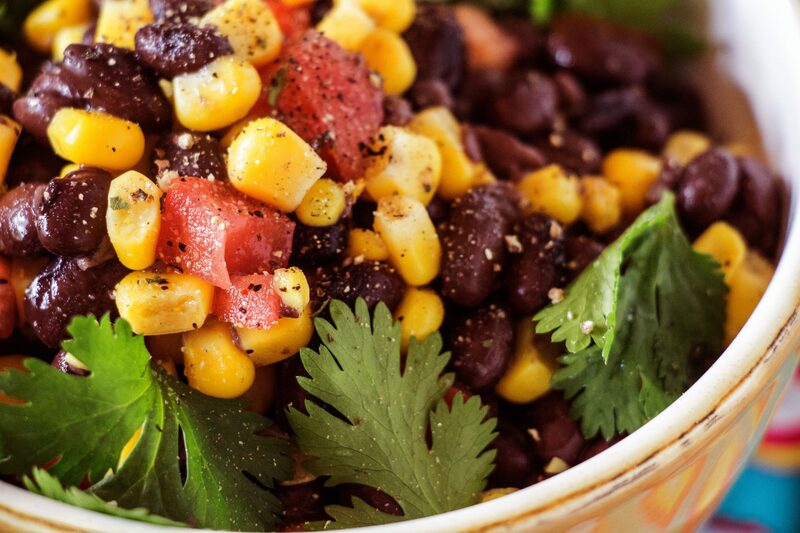 So here are three versions of a black bean salad. The first is extremely easy, and a little more effort is required for the next two versions. I just want you to know that no matter what you do, it will work! Use the ingredients you love and get creative! 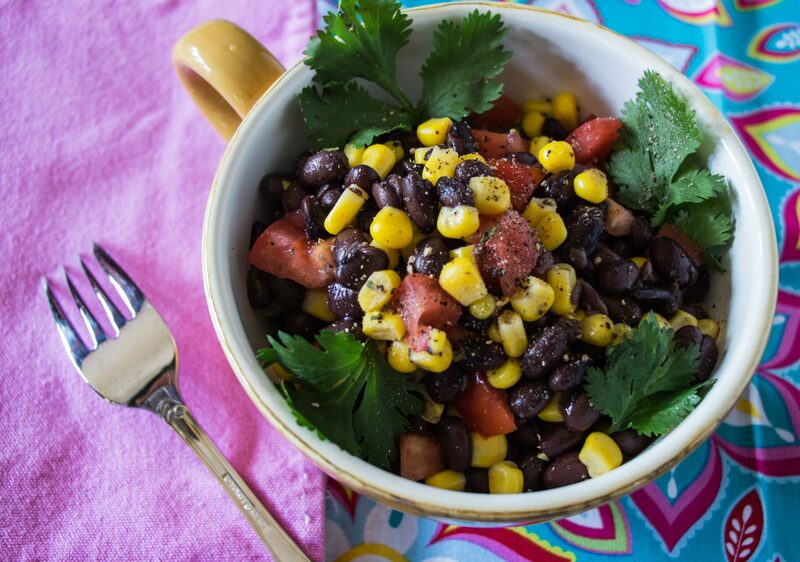 For this super easy salad, combine the black beans, corn and tomato together in a large bowl. Add the tomato, the juice of the lemon, and the olive oil. Then season with salt and pepper and give everything a gentle toss. If you want, the salad can be made ahead of time and sit and room temperature up to an hour before serving. If you need to refrigerate the salad, don’t add the tomatoes until the last minute before serving. Especially if you refrigerate the salad overnight. Toss again, taste for seasoning, and then serve at room temperature. 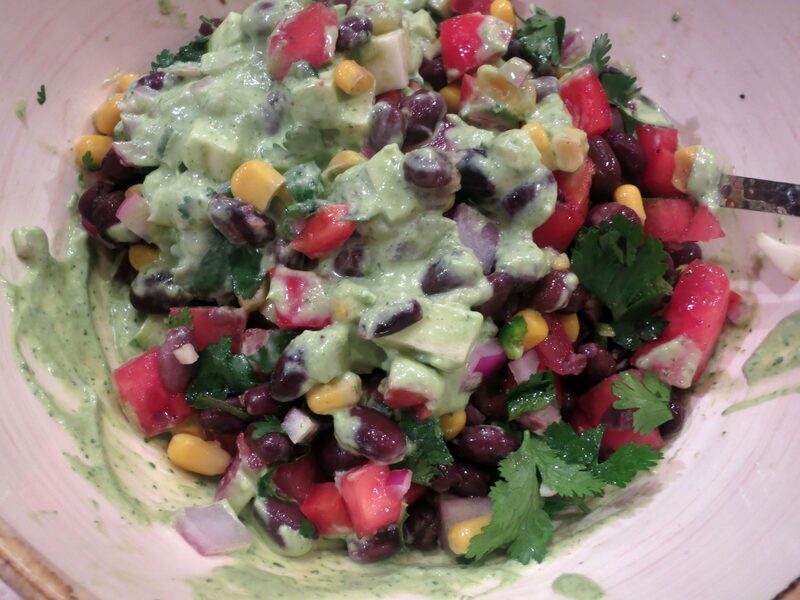 note: If you want this salad more Southwestern inspired, add about 1 teaspoon ground cumin, 1 teaspoon dried oregano, and 1/2 teaspoon ground coriander. And then add a small can of chopped green chilies. Super fast and easy! 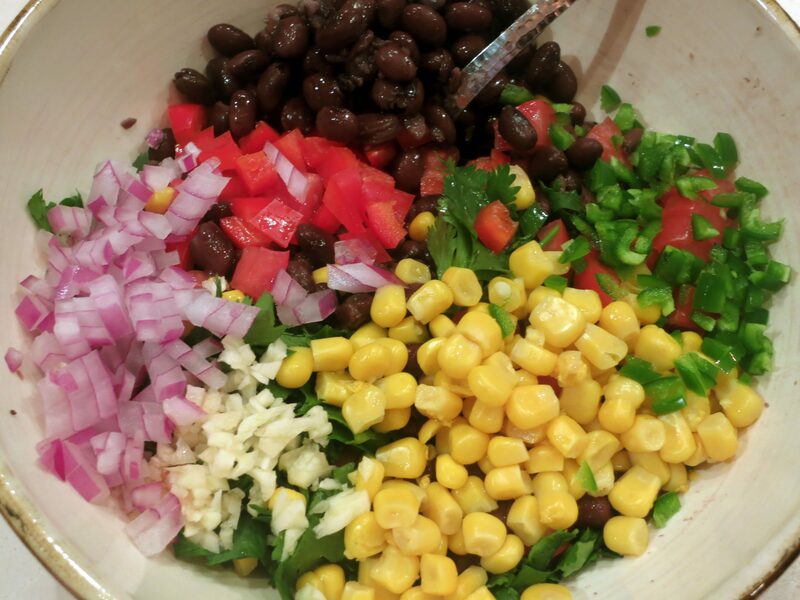 In a large bowl, combine the beans, corn, zucchini, red bell pepper, tomatoes, purple onion, jalapeno and garlic. Toss together gently. Then add the lemon and lime juices, olive oil, cilantro, and seasoning. Toss again gently. As with the above salad, let sit at room temperature before serving, if you wish, so that the flavors come together. Then serve at room temperature. This salad is mostly like the last salad, with all of the fun goodies included, but the dressing is different. For this salad I used the Green Goddess dressing that I posted recently. You don’t have to use this dressing, you can just add some chopped avocado to the salad if you prefer, but I liked the addition of the creamy dressing. It’s an option. But it’s a really good option. It’s just a little more work to make the dressing. I actually liked the green goddess dressing so much that I whipped up a batch! That’s why there’s a bottle of it in the photos. I actually meant to roast some fresh corn on the cob for this last salad but I completely forgot. That would have been instead of using the canned corn. But it just goes to show that you can create your own salad and make it your own. Use the ingredients that you love, whether they’re canned or not. And season how you wish as well. You’re the one eating the salad!!! Enjoy! note: With any of the these salads, vinegar can definitely be used instead of the lemon and lime juices. It’s just that lemon and lime juices go so well with beans. It’s just a choice.